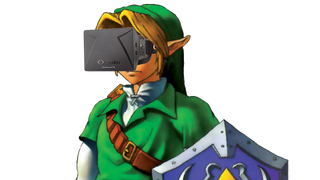 You've (hopefully) seen the original Zelda on the Oculus Rift. Now I'd like to bring your attention to the Oculus Rift version of what some consider the best Zelda game—not only is this in first person, which makes the game look way different, but it also lets Link jump whenever you want. Granted, as Chadtronic notes, this is just a proof of concept—not all functionality is currently present in this version of the game. You can't, for example, pick up rupees. The game is also limited to the Kokiri Forest, and not all the character models are present. Still, despite being mostly a "walk around" demo, it looks neat! You can download this for the Oculus Rift here, if you'd like.